Home » Headlines » Health » Is Laser Eye Surgery The Best Solution To Correct Your Vision? If you suffer from problems with your eyesight you will need to think about how to have your vision corrected. For many years the solution available was to wear glasses or contact lenses. While they still have their place, they also have their own drawbacks. Contact lenses can be bad for your overall eye health for example as it can block the flow of oxygen to the eye or introduce foreign particles when being inserted or removed. Glasses can often be inconvenient to wear, especially for those that take part in sports. So, what can you do if you need another way to help restore your vision? For many people around the world, laser eye surgery is the obvious answer. This kind of minimally invasive surgical procedure uses specially designed lasers to work on the eye to correct your vision. Although used as a catch-all term, there are actually different types of laser eye surgery available. By far the most popular though is LASIK surgery. LASIK is an acronym for Laser Assisted in-Situ Keratomileusis; this popular procedure uses laser technology to reshape the cornea. When completed it helps to ensure the light is refracted properly in the eye to help provide clearer vision. What specific benefits does laser eye surgery bring? If you are considering having this type of surgery, then the below points are worth thinking about. Improved vision – while there are no absolute guarantees, most people report having a much clearer vision after laser eye surgery. In many cases, this can be full 20:20 vision as before any eye care problems you previously had. This is definitely the number one benefit – after all, it is the whole point of having it done. You will love being able to simply walk around without wearing glasses or contacts and seeing properly again in your daily life. 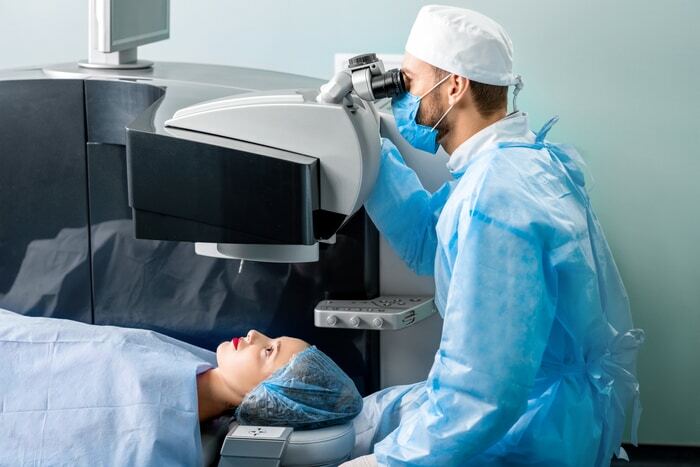 More convenient – there is no doubt that laser eye surgery offers a far more convenient way to deal with any visual impairments and to look after your health. As the eye itself is operated on to produce results directly inside it, there are no external aids needed after the procedure. That means you no longer have to remember to put your contacts in before you go out or take them out when you get in. It also saves you time looking for where you have put your glasses and having to take them off to play sports. With laser eye surgery, you are simply good to do whatever you want at any time, with no fuss. Happier eyes – as we touched on above, traditional forms of correcting vision can actually be bad for your overall health. Wearing glasses for extended periods can cause headaches while contact lenses can cause infections or dry eyes. Laser eye surgery does not do any of that and simply leaves your eyes in their natural state after surgery. It means healthier eyes. Feel good factor – for some people, having poor eyesight can really affect their self-esteem. Traditional fixes like wearing glasses may make them feel unattractive while contacts may annoy them with all the fuss involved in their use. Laser eye surgery helps to solve this for good with one procedure. Many people report feeling more confident and happier after surgery due to having no need for external aids to correct their vision. This last point is always one that causes people to raise an eyebrow – after all, doesn’t laser eye surgery actually cost a lot of money? While it is true that you will have to pay for the surgery, once complete the results are permanent. With no need for further surgery and no need to buy anything to correct your vision, it will save you money in the long term. Compared to buying contact lenses every month or new glasses regularly, it is much cheaper. With all the advances in technology around eye care in recent times, glasses and contact lenses look increasingly old-fashioned approaches to rectifying visual impairment. Laser eye surgery, on the other hand, is a truly modern and effective method. The above list of benefits showcases this perfectly and highlights why you may want to consider this type of surgery to help restore your eyesight. With superb results and comparatively quick recovery time after surgery, it really is a wonderful way to see more clearly in your daily life.